This is another very rare one. It too (Like Siege of Barad Dur, Siege of Minas Tirith, and Battle of Helm's Deep) was mentioned in the Strategy and Tactics Wargame Design book from 1978 and took me years to find. The board (24 x 24) is made of heavy stock paper printed in black and white, no color with a standard hex grid. Two Towers is a game simulation of the epic battle between the forces of good and the evil hosts of the Dark Lord over the one ring of power in the Third age, as stated in the introduction. This is pretty much a standard hexbased wargame of its time, the mid 70s. The rules are similar to all hex wargames. There is a movement phase, with terrain factors. Stacking is allowed up to three pieces (except Ents which can stack two  or three if one is a non-Ent like a Hobbit). Combat is determined by odds based on strength factors (ie. If the attacking units strengths add up to 12 and the defending units strength adds up to 4, the odds are 3-1). A six sided die is rolled and a combat chart determines the result. For this game, there are eight different odds outcomes (usually there are three or four). The possible outcomes are: Exchange  Both sides lose equal amount of factors; Melee  Both sides continue fighting, no result; A-E  Attack is eliminated, remove all attacking units; D-E  Defender is eliminated, remove all defending units; 1-E  The player with the odds number ONE is eliminated; 1-B2  The player with the odds number one is forced to retreat the number of hexes noted; 2-B1  The player with the odds number two is forced to retreat the number of hexes noted; 3-B1  The player with the odds advantage of 3 to 1 is forced to retreat the number of hexes noted. This game does take into account of Magic. Some of the characters, like Gandolf, have a Magic factor of either M1, M2, or M3. The number after the M represents how many odds columns the piece can change by magic. For instance, if Orcs with a strength factor together of 10 attack a Wizard with a factor of 10, the odds are normally 1-1, but if the wizard has a magic factor of M2, the odds become 1-3, favoring the wizard. When two pieces with magic are in combat the magic factors are reduced equally until one or both are out of magic, then the combat is resolved (ie. If a M2 is up against an M3, the result is as if the M3 were an M1 and the other with no magic factor). The Ringbearer has special features as well. Usually this is Frodo. The ringbearer can choose to wear the ring on any turn and disappears then uses a hidden movement feature for that turn (moving to a location that only he knows). However, there is great risk as there should be in wearing the ring. If the ring is worn six times during the game, the ringbearer may fall prey to the evil nature of the ring and starting with the sixth turn, the ringbearer must roll the die. If a 6 is rolled, then the ringbearer succumbs to the evil and the Dark Lord forces win. This is done for every turn after the sixth time the ring is worn by that character. If the piece with the ring is eliminated, the ring is left on the same hex and may be captured by the first piece to occupy the hex. How to win: The forces of the Dark Lord win by crushing condor, capturing the one ring and returning it to the Dark Lord. The forces of good win by the ringbearer taking the one ring to <?xml:namespace prefix = st1 ns = "urn:schemas-microsoft-com:office:smarttags" />Mt. Doom and thus destroying it by placing it on the Mountain hex. A. SIEGES  Because city squares may hold up to ten pieces, direct assault may not be feasible (Minas Tirith triples defender), thus a city may be put under a state of siege by surrounding (all six adjacent hexes must be occupied to do this). To break out, a friendly force from outside must open a hex to the city. Cities may hold out for 10 turns under siege before surrendering. If the garrison in the city wishes to break out it must attack every surrounding adjacent piece. B. SMEAGOL-GOLLUM RULE  Starting turn ten, the Gollum piece may follow the ringbearer and be within six hexes of him from then on. The ringbearer MUST adjust the position of the Gollum piece if he strays more than six hexes away because of the ringbearers hidden movement or any other reason. No attempt may be made to eliminate the Gollum piece by either side. The Gollum piece may, however, attack other pieces and suffer the results called for. The Gollum piece may only attack to obtain the ring. For movement, the Gollum piece is controlled by the nearest piece with magic. Thus, if near a wizard, the forces of Good move it. If near a wraith, the foces of the Dark Lord control it. If near both, the strongest controls. C. ORCS  Orcs tend to be unstable at times and sem to hate each other as much as they everyone else. To simulate the temperament of Orcs, the player controlling the Orcs must shake a die every fifth turn to see what results the Orcs foul moods have. On rolls of 1-5, take off the same number of combat factors as rolled. It is assumed that the number of Orcs cleaved each other to pieces fighting over fell meat or some other reason. On a roll of a six, the Orcs generally rampage and all Orc pieces move back 2 hexes except the Uruk-Hai. D. SHELOB  When Shelob the spicer attacs a piec and the combat result in an elimination, the piece is merely paralyzed for one turn and may not move. If Shelob attacks again and the elimination is rolled, the piece is then removed from the board. E. RINGWRAITHS  If a piece eliminates the Black Captain of the Ringwriaths (RW) M2, and does not posses magic, the piece is in danger of elimination also. A die is rolled, on a 1-4, the piece is also eliminated, on a 5 or 6, the piece is paralyzed for one turn. STRATEGY & TACTICS: Careful use of the ring and proper use of magic can win the game for the forces of good and get them out of tight spots. Organization and good control of the Orcs and Wraiths will give the Dark Lords host a chance of preventing the ringbearer entering Mordor. Time at first is on the side of the Dark Lord, but once the forces of good marshal their troops, the balance of power may swing suddenly. RULES  ARGUMENTS  DESIGN NOTES: When playing the game, if you come to a question about the rules, rather than wait for a long time to get your questions answered, figure out the best compromise and write it down what you decided on a sheet of paper and keep it with the game. This saves time nit-picking rules and means a more enjoyable game. If for example, one side wins too easily, simply delay their order of appearance. The game is basically a strategic version of the great war for the one ring. Orcs have a very slow movement rate because you would move slow too if you had iron shod shoes. Many characters and pieces had to be generalized to get the game done. If you wish, just add your own pieces to polish the game off if you desire more detail than provided by the counters included. Get a six sided die; and the four books (I think these guys mean The Hobbit and Lord of the Rings) on the topic for extra information. Remember to watch the order of appearance, the time chart for Orc and Gollum rules and keep track of how often the ringbearer wears the one ring. Finally, we hope you enjoy the game and play it often. My copy of this game also came with a Questions and Answers sheet. There are 10 questions and answers. I dont know if these questions came from fans of the game and it was popular enough for the publishers to add this sheet, or if the beta game testers (whoever they might have been) had these questions. My guess is that this was given to a couple of their friends and this is what they wrote. But I could be wrong. For anyone who might have any interest, or if you have this game but it didnt come with this sheet, here are the famous 10 questions. The answers provided are free. Q  Are all at start pieces placed on the board before any movement? Q  What does any square in Arnor mean? A  Any square hex with the letters of the name on it. Q  How many pieces may use magic in a multiple unit attack or defense? A  One maximum regardless of how many have magic, only one per attacker or defender may use magic in a single attack. Q  May the initial placement of appearing units exceed stacking? A  Yes, but only until movement begins. Q  What if you have more than 6 to 1 odds? A  You still use the 6 to 1 table. Q  What if you have units appearing at Helms Deep and it is occupied by orcs? A  You must wait until it is clear of enemy units regardless of how many turns it takes. Q  What does halves movement mean? A  Twice the normal movement rate is required, a mountain hex costs 2 movement points to cross. Q  What if you are crossing a river and attacking a mountain position? A  You are obviously in a bad situation, but no piece can be more than doubled except in Minas Tirith. Q  What is the best way to cut out the counters? A  The counters are a new special type with 48pt thickness which makes them easy to pick up but a toughy to cut. Use scissors, and equally good  a paper cutter, trim any rough edge tears with an X-Acto knife. Q  How does hidden movement work? A  Only forces of good designated ringbearer can use it, if that piece is eliminated another ringbearer must be designated. Simply remove the piece and ring and be Honest about where you are. Now on to the critique of the game. Like a bunch of the games I have found recently, I have not had a chance to play this one yet. However, I have played many hex wargames and reading through the rules, this one looks like it plays well. Very similar to The Siege of Minas Tirith or The Battle of Helms Deep. It just has fewer rules. To me, that means this game may need a little polishing by adding a few more rules like more information on Hidden Movement or special considerations with Frodo and the ring within the borders of Mordor, or even rules dealing with sending the Ring to Gondor rather than destroying it. This last one is one of the mysteries to the Dark Lord that would keep him guessing as to where the ring is. If anyone has played this game, I would appreciate some input. As for the quality of the game; it is on the lower side of quality, but not bad. I guess to cut costs, there are very few colors to this game (a black and white board and game pieces). The mapboard is a little difficult to work with as it doesnt have really good folds. My game has rolled folds making for an awkward map that doesnt lie flat. It needs a sheet of glass or Plexiglas over it to keep it flat. Also, on my game, the counters were cut out of a sheet. I have not seen a unsued condition of this game (in fact, I have only come across two of these games  Mike owns the other one). My game counters are mounted on white foam cardboard. The reason I am guessing they were cut out and not punched is because there are not tell tale signs of the pieces being attached prior to being punched (if you have seen these old hex wargames, you know what I am talking about). Plus, not all of my pieces are the same size. It is as if the edge was slightly off when cutting them out. This is also address in the Q&A sheet on how to cut them out. The artwork for the board is good, even though it is just black and white. Unfortunately, very little imagination went into the counters. Very Plain. Just an abbreviations of the character (Wiz = wizard, Hob = hobbit, RN = Ranger, She = Shelob, etc.) and the movement, strength, and magic factors. I suppose the game can be played whether or not the artwork is good or not since all the information is there, but it could have looked better. The early version of The Battle of the Five Armies is the same way. From what I can find out about this game, this is one of the harder ones for collectors to find. It took me four or five years before I even anyone who had the game. I heard once that a copy was sold at Gen Con around 1997 and a couple of game searchers had this game on their list but they had not found it. So there is an interest for this game, there just werent very many copies made. 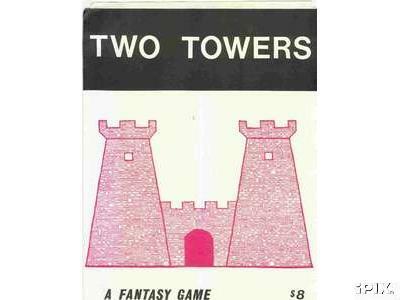 I dont have any more information on Fantasy Games, and as far as I can find, this was their only game. The authors didnt put their names in the rule book, so I have no idea who they are. If anyone has any further information, let me know and I will post in here. At some point I intend to play this game. When I do so, I will let you know how it plays. The map does have a greenish tint to it. Board (24 x 24), Heavy paper, white with a greenish tint paper with black ink. Counters; 200 total (67 white  forces of good; 133 black  forces of Dark Lord)  probably mounted, but not die cut (at least not with the version I have). The Forces of Good on White Counters, of course.